I've always enjoyed Steve Martin's comedy. However, I had added the book to my list on a whim. Just because I liked his comedy, would I like his writing? Yes! I'm so glad I kept the book on my list and heard it before overthinking the choice and deleting it. Mr. Martin weaves his private and professional lives seamlessly. He artfully allows us to see how the dynamics of each shaped the whole man. With the simplest of words he lays bare such tender feelings. I was moved by the portrayal of his family relationships. And accompanying him on the step by step, year by year odyssey of his career prompted such admiration. Before hearing this book, tenacious, was never a word I coupled with Steve Martin. Now I see him as not just Tut, but Tut the Timex Watch. I hope you give this book a chance. Also, Steve Martin's narration and banjo music gave the entire experience even more heart. This book is so dull and boring. Nothing raw nothing funny, I should have kept my money. Very interesting to find out so much about a very funny guy. Not an overnight success but an interesting journey for an interesting man. I'm a huge Steve Martin fan and so was interested in how he grew up and what shaped his life. Very interesting and entertaining story. Enjoyed narration by the author. A serious biography of a funny man. I wasn't expecting to enjoy this book, but I read a good review of it and took a chance. I had no idea how complex a person Steve Martin is/was. It really is a fascinating peak into one comedian's personal history, as well as an interesting critique of popular culture and comedy in the 70s and 80s. I highly recommend it! I already admired and enjoyed Steve Martin's talent, but this book told the story of the hard work, determination, and sacrifice he made to achieve the tremendous success he has enjoyed. I loved his writing and his own narration of his work. Only he could repeat his own bits, jokes, and expressions and bring them to life. While I appreciate that it was not an autobiography, as such, it still had enough personal history to be intriguing. I only wish he had taken it further into his later career. I'd have loved to hear stories about his many other movies. Also, it would have been interesting to know more about his later in life personal relationships, marriage, family and so forth to see what kind of guy he is when he is just "Steve". But, all in all, it was well worth it and fun to listen to. i have one thing to say about steve martin; he's a comic genius: this book really delves into the strategy and theory behind his comedy as well. (or anti-comedy.) .... ok i have two things to say about steve martin; he's a comic genius and a man with incredible tenacity. reading his story helps you appreciate not only his natural talent, but the toil and absolute determination involved with becoming successful, especially in the comedy industry... ok i have three things to say about steve martin; he's a comic genius, has incredible tenacity and is a sentimentalist. his story also reflects on his relationship with his family and friends; relationships that really developed his journey towards comedic fame. 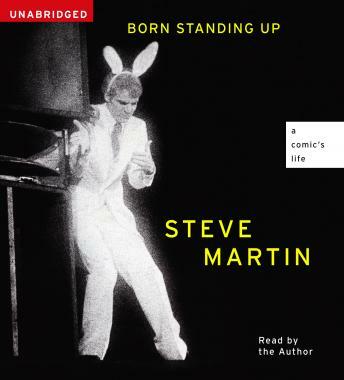 alright i have FOUR things to say about steve martin; he's a comic genius, has incredible tenacity, a sentimentalist and....... hahaha.. READ THIS BOOK!